Vermont Rifle: Hunt 6 – 50 Weeks To Go… - the4pointer.com | Real Hunts. Unreal Stories. Just one day earlier I’d watched Auburn beat Alabama on a last second miracle play in the Iron Bowl and I interpreted that as a sign that I would have the good fortune of connecting with a big buck on the last day of Vermont Rifle Season. But as the minutes passed by and time grew closer and closer to 4:44 (end of legal light) my gut was telling me it wasn’t meant to be. I sat on the side of the hill but instead of watching a big buck walk in to view I was only left to my thoughts as darkness overtook the woods. I remember watching the clock tick from 4:43pm to 4:44pm and telling myself “It’s over.” Rifle season had come to an end and I had yet another unfilled Vermont Buck tag in my pocket. 2006 was the last year I filled my rifle tag in Vermont but that buck is the reason why I keep coming back here. The deer population is low and thearea is both large and difficult to hunt, but the possibility of shooting a big one is much greater than other areas of the state where I bow hunt. I only saw two deer this year. Well, better make that one and a half. I saw one whole deer and parts of another one that I never had a chance to clearly identify. Sightings that few and far between can cause one to want to give up but you have to press on if you want to be successful. We saw plenty of buck sign and during the two weeks our cameras were in the woods we got pictures of multiple legal bucks, they just all happen to show up long after dark. Their tracks are all over the place but only God knows where they go during the day. I covered miles of woods and never jumped a single deer. Each year, I look forward to these past two weeks more any other hunting season. There is just something about carrying a rifle on your back while still hunting through the Vermont woods. It’s a tradition that has taken place in these woods for over a hundred years and I know I’m not the first to hunt this land, nor will I be the last. This year, the elusive whitetail buck proved to be a worthy opponent yet again and left me standing in the woods staring at the clock as the season ended already thinking of next year. All is not lost, I’ll be back in the woods this coming Saturday holding a muzzleloader with hopes just as high but the feeling of tradition is just not the same. Don’t get me wrong, I’ll be happy to have a crack at a buck with a muzzleloader, but I’ll still be disappointed I didn’t fill my rifle tag. I could have sat out in the woods for another hour after dark thinking about the woods, the big buck, and life in general. The temperature was in the low 30’s and I was comfortably dressed, but as disappointing as it was to say goodbye, it was time to go. I met up with Josh and Dad and we stood there in darkness and gave thanks to God for a safe and fun season, living in a country where we have the freedom to hunt, and the opportunity to hunt – even though none of us came home with a buck. That right there is exactly why I love this season so much. I leave you with a picture we received on camera of a buck that will keep one awake at night dreaming. This big bodied, mature buck passed by our trail camera on November 24th. 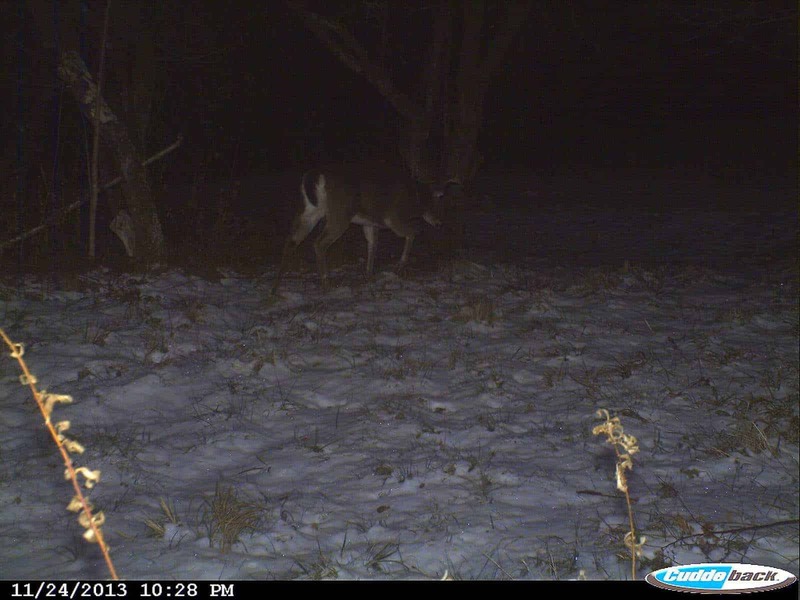 Thanks to the snow, we know he was the only deer in 6 days to walk within 200 yards of this camera. One deer in six days is not exactly good odds, but this picture confirms what I have always believed…The big ones are out there and one day we will run in to each other.